Hydrangeas are popular shrubs with spectacular flowers. The sight of a large hydrangea bush with neon blue or pink flowers can take your breath away! All hydrangeas grow well in locations with morning sun and afternoon shade; in colder climates, they may do well in all-day sunlight. They require rich soil, and some varieties respond better to the use of compost and rotted manure than to commercial fertilizer. They prefer an evenly moist soil, but do not tolerate boggy conditions. Nursery-grown hydrangeas can be planted any time, but it's best to transplant hydrangeas when they are dormant whenever possible. There are four different kinds of hydrangea: big leaf, oak leaf, panicle, and smooth. The bigleaf hydrangea is the shrub that comes to most people's minds when they hear someone say "hydrangea." The flowers of Hydrangea macrophylla can be blue or pink or some shade in between, such as lilac or purple.These deciduous shrubs are hardy from zone 6 to zone 9, but in colder winters it may be necessary to protect the bush so that the flower buds do not freeze. Most shrubs in this category grow on old wood, that is, branches that were grown the previous summer. Flower buds are formed on the stems around August, September or October for the following summer's blooms A hard winter can kill the flower buds, so that the shrub survives but does not flower the following summer. Prune Hydrangea macrophylla cautiously. Deadwood can be cut out any time of the year. In mature shrubs that need revitalization, about one-third of the stems can be removed at ground level, which will stimulate new growth from the roots. The new stems will not produce flowers until the following year. If light pruning is necessary to reduce size or shape the shrub, stems can be cut back in June or July, after the shrub blooms but before buds form for the following year. Shrubs can be deadheaded as needed. A few bigleaf hydrangeas are remontant, which means they will flower on new wood - branches grown in the current summer. They are often called 'all summer' or 'endless summer' varieties. 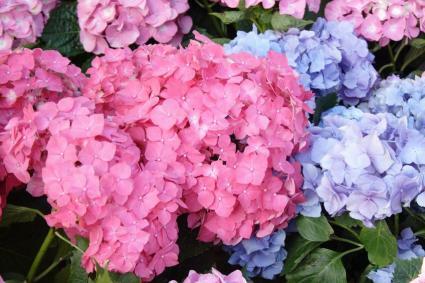 These can be grown and will bloom successfully in colder winter areas than other Hydrangea macrophylla. Hydrangea macrophylla grows more than eighteen inches annually, reaching a mature height of five feet and mature spread of five feet. There are two kinds of flowers. The hortensias, or mophead, hydrangea has large, rounded flower heads. The lacecaps have flatter heads made of showy sterile flowers in a ring around a center of fertile, bead-like flowers. The flowers will be blue when grown in acid soil, pink when grown in alkaline soil. Adding aluminum sulfate will lower the pH of the soil; adding dolomitic lime will raise the pH. These are sometimes called smooth hydrangeas. The most famous variety in this group is Hydrangea arborescens 'Annabelle'. Its beautiful flowers appear as pale green globes in early summer. They slowly grow larger and turn white. The flowers can be as large as 10 inches across, and may need some support if the shrub's canes are weak. The flowers will remain on the shrub for many weeks, slowly turning a pale brown. 'Annabelle' is easy to grow. This deciduous hydrangea is hardy from zone 3 to zone 9. Some growers in zones 2 and 10 have grown the shrub successfully. In general, 'Annabelle' prefers cool winters, and it does not do well in the moist heat of Florida. Hydrangea arborescens prefers rich moist soil, and it can be grown in sun or dappled shade. Many growers find that it blooms best if it gets morning sun. The growth rate is rapid, often more than 18 inches in a year. The shrub matures to a height of five feet and a spread of five feet, with a rounded form. Hydrangea arborescens blooms on new wood. In colder climates, it will die back to the ground in the winter. In warmer climates, pruning severely in early spring will encourage larger flowers. Because it does well with severe handling, it can be grown as an informal hedge. Hydrangea quercifolia is sometimes called Oak-leaf Hydrangea, because its leaves are shaped like oak leaves. It turns a bright red color in the fall. The Oak-leaf hydrangea is native to the United States.Oak-Leaved Hydrangea is hardy in zones 5 to 9. The top growth dies back in winter, sometimes to the ground. This shrub may need protection from high winds. It flowers in midsummer. The white flowers are cone-shaped; they often fade to pink and then to tan. Hydrangea quercifolia can be grown in sun or shade in moist soil. It will thrive in sunnier and drier locations than most other hydrangeas can tolerate, but it needs excellent drainage in wet areas. It is very susceptible to root rot in wet areas. Oak-leaved hydrangea grows twelve to eighteen inches annually and matures to a height of six feet and a spread of eight feet. 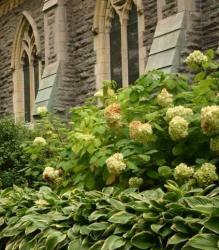 The panicle hydrangea is hardy from zone 3 to zone 8 and is native to North America. It bears white, cone-shaped flowers in midsummer, which often turn to pink as they age. The most famous variety is Hydrangea paniculata 'Grandiflora', nicknamed 'PeeGee'. In fact, this variety has been some popular that many people call all panicle hydrangeas 'peegees'. This deciduous shrub grows more than eighteen inches annually. It matures to a height of eight feet and a spread of ten feet, and has a rounded form. Panicle hydrangeas tolerate pruning more easily than other hydrangeas do. They bloom on new wood, so they can be pruned in the fall, winter, or spring. It is not necessary to prune them every year, although dead or damaged wood should be removed promptly. Although there is a large range of land in Great Britain in which Hydrangeas seem happy, there are other inland and cold districts in which they make poor growth, or are cut down so frequently that experiments come to little. I made a trial myself on a cool hill-side in Sussex without getting any bloom or a healthy growth; but on the other hand we see, especially in the south of England and Ireland, beautiful results in warm valleys and on sandy and alluvial soils even from the use of one kind. Hydrangea Arborescens - A vigorous and hardy shrub, 4 feet or more high, flowering freely July and August. Flowers a dull white, very small and crowded. Native of eastern N. America, south of New York State. The variety grandiflora, a very beautiful form, with flowers large and pure white, is from the mountains of Pennsylvania. syn. Hydrangea pekinensis (Hydrangea Bretschneideri) - A Chinese shrub from the mountains near Pekin. Planted in the full sun is said to make a very handsome shrub, vigorous and hardy, and flowering in midsummer. Nettle-leaved Hydrangea (Hydrangea Hirta) - A dwarf shrub, 3 or 4 feet high, with slender hairy branches and Nettle-like leaves. The leaves and branches become nearly or quite glabrous with age. This, although not a showy species, seems to be a pretty, compact, dwarf shrub, with numerous clusters of white flowers. A native of the mountains of Japan. Hydrangea Hortensia acuminata - A muchbranched shrub, 2 to 5 feet high; flowers blue. It sports according to locality, and Maximowicz enumerates four such sports, viz. : In open places and in a rich soil it is stouter, with erect thick branches, large, broad, firm leaves, and larger flowers, with somewhat fleshy sepals; under cultivation it becomes more showy, passing into H. Belzonii. In woods and on the shady banks of rivers it grows taller with slender stems, pointed leaves, and much smaller flowers. Hydrangea Hortensia japonica - The H. japonica of Siebold and Zuccarinis Flora Japonica, and the H. japonica macrosepala of Regels Gartenflora. It is exactly like acuminata, save that the flowers are tinged with red, and the sepals of the barren flowers are elegantly toothed. Hydrangea Hortensia Belzonii - A short stout plant, with beautiful flowers, the inner sterile ones being of an indigo-blue, and the enlarged sterile ones white, or only slightly tinged with blue, and having entire sepals. There is a sport of this in which the leaves are elegantly variegated with white. This was raised by Messrs Rovelli, of Pallanza. Hydrangea Hortensia Otaksa - This has all the flowers sterile and enlarged. A very handsome variety with rich dark green leaves nearly as broad as long, and large hemispherical heads of pale pink or flesh-colored flowers, very fine when well grown. Hydrangea Hortensia communis - The old variety with rosy-pink flowers, commonly cultivated in European gardens. It differs from the last in being perfectly glabrous in its longer, less-rounded leaves, and in its deeper-colored flowers. Hydrangea Hortensia stellata - The chief character of this variety is in the flowers, which are all sterile and double. The variety in cultivation has pink flowers, but they are described as being either pale blue or rose, finally changing to a greenish color, and distinctly net-veined. Climbing Hydrangea (Schizophragma) - S. hydrangeoides is a Japanese climbing shrub allied to the Hydrangea, with tall slender stems that send out roots which will fix it to a wall. Its wood is soft, resembling that of the slower-growing Ivies, and it annually gives off fresh sets of roots along its branches by means of which it clings to rocks, stone, stucco, bricks, and even wooden palings. Its leaves are much less in size than those of the climbing Hydrangea, sharply toothed at the edges, and of a lovely shade of green, which contrasts prettily with the reddish tinted young wood. It is deciduous, of free growth, and flowers freely in sunny positions. The sterile flowers, though similar in effect to those of the Hydrangea, are readily distinguished, being composed of a single bract, whereas the Hydrangea flower is made up of four. I know one case where a plant has grown in a sunny corner of the house near French windows, up the sides of which there is lattice-work, and so charmed were the owners with the tender foliage, feathering the coign of the window, that they made more lattice-work in front of the window so that the creeper could extend and form a natural sunshade before the glass. In a few years a plant had grown 11 feet high and as much in width. Oak-leaved Hydrangea (Hydrangea Quercifolia) - This is a fine distinct kind, and though not showy like the popular kinds, it is an excellent shrub, and one I have noticed growing with fine vigour in seashore gardens. The leaves have a good deep color in the autumn, and the flowers are beautiful, while old plants have a picturesque habit. Hydrangea Sargentiana - Of the several species of Hydrangea introduced from China, this is the most distinct. The stems are stout and erect; the large and handsome leaves very hairy on both surfaces, the upper one of a deep velvety green. The flower-heads are broad, but the large white sterile blossoms are limited to a few outside the cluster, the small fertile ones being of a bluish color. From a flowering point of view it is far from the showiest of the Hydrangeas, but it is a distinct and striking species. An uncommon feature of the plant is the large scale-like hairs with which the stems and leaf-stalks are covered. Changing Hydrangea (Hydrangea Virens) - This is a remarkable and elegant shrub, varying in height from 2 to 6 feet. The branches, straight, slender, and polished, bearing small, thin, deeply-toothed leaves, 2 to 3 inches long, yellowish-green above and pale beneath, with small clusters of flowers, some of which are sterile. Altogether this is a pretty little shrub, and it is somewhat surprising that it has not been introduced, as it is common in the neighborhood of Nagasaki in Japan. The white variety, Thomas Hogg, is a very fine one, now widely cultivated. Most of the above-named deserve the attention of all who have soil and climate suited to these shrubs. Fortunes Hydrangea (Hydrangea Chinensis) - Near the last, but of more robust habit, with leaves 3 to 5 inches long, and with cymes of flowers much large. If differs from H. virens in the leaves, being green on both sides, and in the enlarged sepals being nearly equal in size, much thicker-in fact, almost fleshy-in substance, and remaining on the branches until the fruit of the fertile flowers is ripe. This species was collected by Mr Fortune in N. China. Plumed Hydrangea (Hydrangea Paniculata) - A shrub or small tree. According to Maximowicz, the only Japanese Hydrangea that becomes a tree. It grows as much as 25 feet high, with a dense rounded head and a straight trunk 6 inches in diameter. But it more commonly forms a shrub a few feet high, bearing enormous panicles of flower. 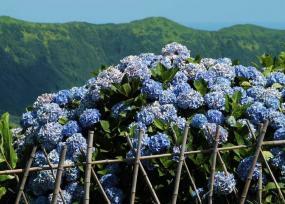 With the exception of H. Hortensia, it is the commonest species in Japan, growing throughout that country both in the mountains and the plains, being more abundant in the northern parts, and it is said to vary very much. It is commonly cultivated by the Japanese. The clusters are often 1 foot long and half as much in diameter, but to get such flowers we must cultivate well and prune the shrubs hard down in winter. See the following slideshows for additional tips for seasonal gardening.